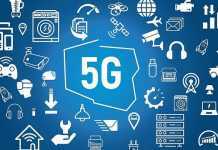 As factories become increasingly smarter, so does the technology used to create the sensors, automation and equipment that controls and monitors these installations. 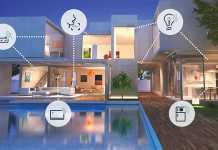 Microcontrollers (MCUs) need to quickly and efficiently adapt to different types of sensing and measurement applications, especially those involving the sensing of light, humidity, temperature, power current, carbon monoxide, and many other conditions or parameters. 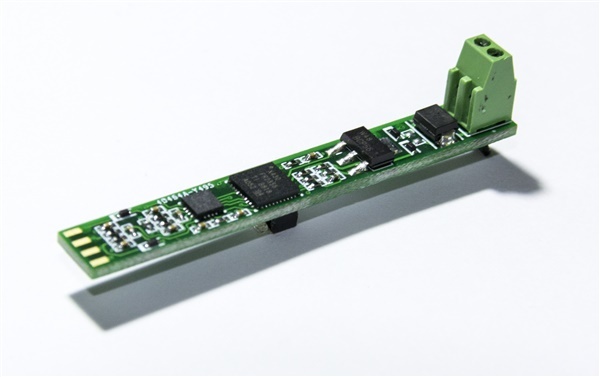 One way to address the need for adaptability is through integrated flexible analog signal-chain configurations within the MCU that can be adjusted to meet specific application needs. This integrated signal-chain approach is a key component of the new MSP430FR23xx MCU family, with multiple configurable smart analog combo peripherals. 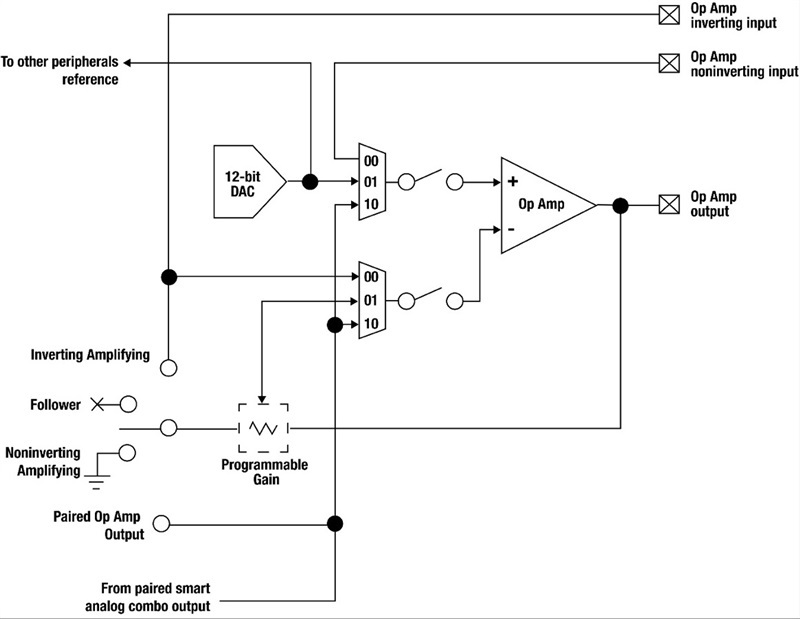 The smart analog combo comprises several analog signal-chain elements including an operational amplifier (op amp) with programmable gain amplifier (PGA) capability and a 12-bit digital-to-analog converter (DAC). These peripherals offer many configuration options, enabling you to configure the internal signal path according to your application. Figure 1 is a high-level block diagram of a smart analog combo module. The MSP430FR2355 device includes four smart analog combo modules, enabling you to configure each one independently from the next and select combinations of DACs, PGAs and op amps as required for your application. There are also some options allowing the internal routing of one smart analog combo to a paired module, which reduces the need for external signal-chain connections. 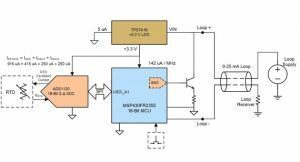 The MCU also includes a 200KSPS 12-bit successive approximation (SAR) analog-to-digital converter (ADC) and two enhanced comparators to provide more signal chain elements within the MCU. One application for the smart analog combo and the MSP430FR2355 MCU’s -40 to 105°C operating temperature is a temperature transmitter found in sensing applications in factories. The 4mA to 20mA loop-powered resistance temperature detector (RTD) temperature transmitter reference design featuring the MSP430FR2355 MCU provides a low-component count, low-cost solution. 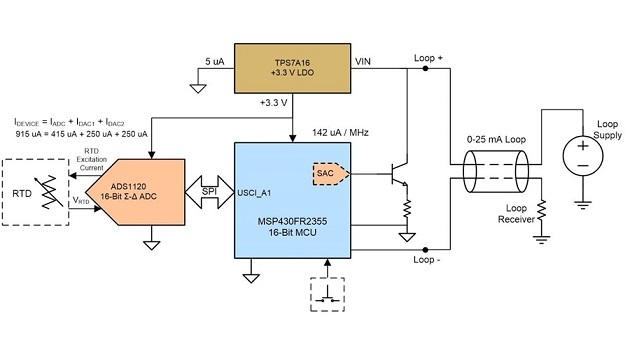 The reference design takes advantage of the on-chip smart analog combo modules in the MSP430FR2355 MCU to control the loop current so a stand-alone DAC is no longer required, as shown in Figure 2. 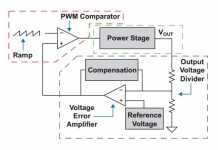 This design achieves a 12-bit output resolution and an output current resolution of 6μA. The design also incorporates reverse-polarity protection, as well as International Electrotechnical Commission (IEC) 61000-4-2 and IEC61000-4-4 protection on the loop-power input. Figure 3 shows the actual hardware used for testing this design. The growth of sensing applications within factory automation is driving the need for more analog and peripheral integration within MCUs. Adding configuration to integrated analog elements provides flexibility to developers to address the varying needs of factory automation systems.